Plus-size model Ashley Graham recently posted on her Instagram page a teaser commercial she did for SwimsuitsForAll, where the gorgeous brunette shows off her figure in a black two-piece. … says Tara in Spanish Magazine S Moda. … says Heidi, who is looking quite skinny these days. One time I got X-rayed by a chiropractor and he goes, ‘You know, you don’t actually have a big build.’ It’s like, you’re just fat! Bigger girls do better in comedy. I don’t know why. Maybe because people find it easier to laugh. It’s very hard to laugh at someone who’s very attractive, I think. And normally those people don’t have a great personality anyway. I do have these dreams, like, ‘What if I just went to a health farm and lost 50 kilos? What would happen? Would it affect my career?’ But then I think, that’s never going to happen. … says 28 year-old Rebel. Towards the end of the interview, they get interrupted by David Oyelowo and David and Bendy chat amicably, then David leaves and Bendy talks about the historical accuracy in films, and whether TIG should have shown more of Alan Turing’s homosexuality. I found his thoughts interesting, for what it’s worth. Incidentally, Benedict has joined Stephen Fry’s campaign to pardon the more than 49,000 men who were arrested and charged with crimes involving their homosexuality – you can read more about it here. As for Benedict referencing his “devotional love” for Sophie Hunter… eh, I don’t know what you want me to say. I don’t think he’s really “devoted” to her. I think they were casually dating and she got pregnant and they decided to make a go of it. What’s interesting to me is that he’s trying to convince himself that this is some kind of epic love story. Last thing – Sophie Hunter sat front-row at the Valentino show this week. She sat beside Anna Wintour!! This means that Sophie will be wearing Valentino at the Oscars or her wedding (or both). And that Sophie is probably going to be featured in Vogue very soon. Photos courtesy of WENN, Pacific Coast News. Shh… we have to speak quietly and quickly before CB comes in here, yelling about her man Matt Damon. 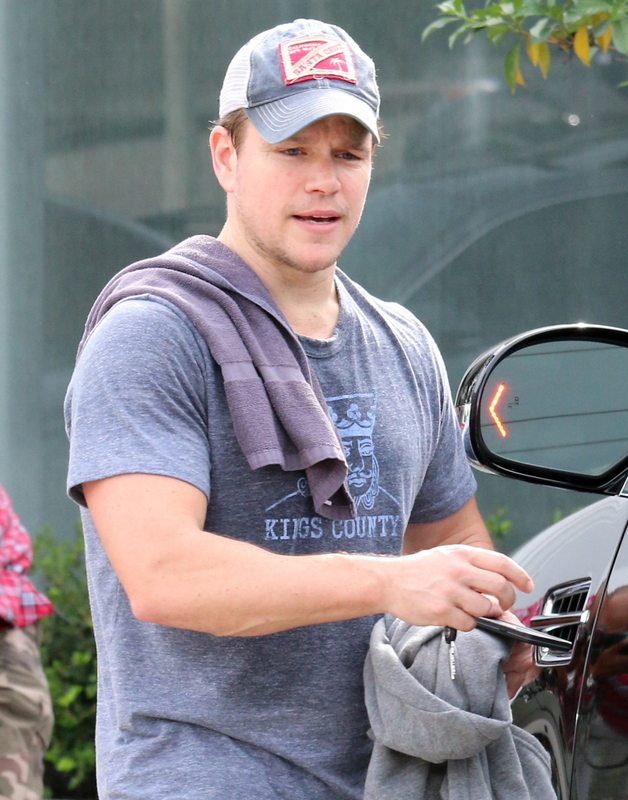 These photos are of Matt leaving his LA gym a few days ago. From the looks of things, he was working on his arms. I try to hide my Damon Love away for fear of being shanked by CB, but g—damn he looks good here. I like my Damon with some meat on his bones. Anyway, Matty D (as I call him) is very much a Boston boy, so it’s no secret that he’s rooting for the New England Patriots in the Super Bowl. But with #DeflateGate still percolating through the media, Matty D is one of several Boston Boys sticking up for their Tom Brady. Jimmy Kimmel pointed out last night that there are some people posting YouTube videos “confessing” to being the person to deflate the balls, so Kimmel decided to have some fun with it by bringing together some famous Boston Boys, like Matty D, Ben Affleck, Chris Evans and John Krasinski (who is actually from Newton, not Boston). The celebs start appearing at 1:30 minute mark but the whole video is pretty great. Maybe it’s because I’m so used to hearing Southern accents, but I do find the Boston accent rather charming. 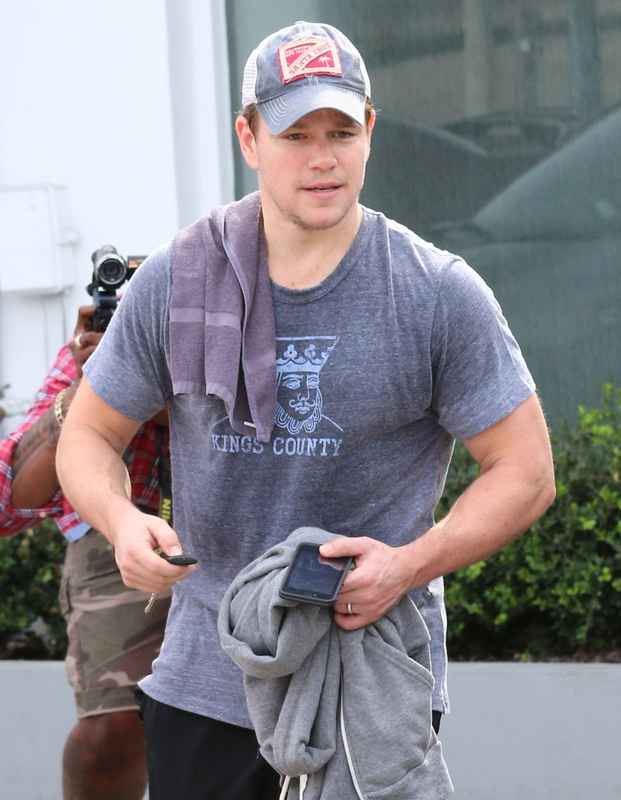 I prefer it on Matty D rather than Affleck though, sorry not sorry. Affleck doesn’t look good with the haircut. But Matty D is perfect. And Bedhead’s boyfriend Chris Evans wore a fake mustache that’s pretty amazing. Did Tom Brady try to ‘ban’ Gisele Bundchen from the Super Bowl? The Super Bowl is this Sunday, and on a gossip-level, I could not be less interested in the actual game. I want to see if there are any more ball-shenanigans and I’m interested to see if Gisele Bundchen is going to alienate a bunch of people again, but other than that… yeah, not interested. I’m probably going to go the movies. Still, let’s talk about Gisele! Back in 2012, when the Patriots lost to the Giants, Gisele mouthed off to a reporter right after the game. She was trying to defend Tom Brady and she ended up throwing his teammates under the bus when she said: “My husband canot f—king throw the ball and catch the ball at the same time.” Allegedly, the Patriots were super-pissed at Gisele about that. Obviously. The University of Phoenix Stadium in Glendale, Arizona will be completely packed for Super Bowl XLIX on Sunday, but New England Patriots quarterback Tom Brady is hoping one person doesn’t attend: his wife, Gisele Bündchen! A source revealed to OK! Magazine that Tom is “desperate” to keep wife from attending the game on Feb. 1. “He knows there’s way too much on his mind to let Gisele become a distraction,” the source told OK! Instead, Brady asked his supermodel wife to watch on the television like millions of others with their three children. And now that one controversy hangs over the Pats as they enter the Super Bowl (the Deflategate scandal, alleging the team deflated footballs during the Jan. 18 AFC Championship Game), Tom does not want anything else to go wrong. I’m kind of torn. I would imagine Tom is too. Like, I do believe that he loves his wife and he loves how she passionately supports him, but he’s probably also aware of the fact that Gisele alienates a lot of people, including his teammates and their wives. In any case, Gisele is coming to Arizona, I have no doubt.